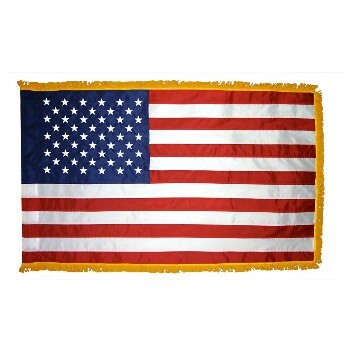 U.S. nylon flag with sewn stripes & embroidered stars. Pole sleeve with tabs. Yellow-gold fringe on three sides. Click button below to select size. Set Includes: U.S. flag with yellow-gold fringe and pole sleeve, two-piece 1-1/4 in diameter dark oak pole with brass screw joint, glossy gold ABS weighted floor stand, glossy gold ABS eagle ornament, 9 ft yellow-gold cord with tassels. Set Includes: Two-piece 1-1/4 in diameter dark oak pole with brass screw joint, glossy gold ABS weighted floor stand, glossy gold ABS spear ornament, 9 ft yellow-gold cord with tassels. 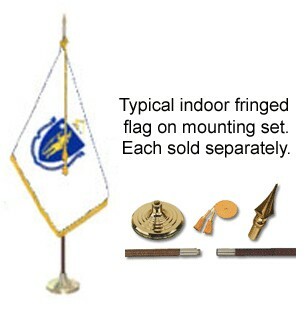 Flag sold separately.